Rosa and Eddie are among hundreds of teens applying to NASA’s mysterious Interworlds Agency. They’re not exactly sure what the top-secret program entails, but they know they want in. Rosa has her brilliant parents’ legacies to live up to, and Eddie has nowhere else to go–he’s certainly not going to stick around and wait for his violent father to get out of jail. Even if they are selected, they have no idea what lies in store. But first they have to make it through round after round of crazy-competitive testing. Their lives entire life as lead to this moment: being part of NASA’s mysterious Interworlds Agency. But first, Rosa and Eddie must compete in a series of tests to determine which teens—among the hundreds—will be appointed to Team 3 and save the world from aliens planning to destroy Earth. You will root for these characters. I would like to have these characters in What Goes Up on my side. There’s Rosa Hayashi, a mixed-race girl who’s trying to live up to her parent’s; Eddie Toivonen, a white boy who wants to escape his deadbeat father; and Trevor Clayborn, a skinny boy who always seem like a substitute. These three teens are incredibly brilliant, but they aren’t smug about it. They are funny too. They may be incredibly intelligent, but these are characters you can still relate to. Each are trying to figure out how to be their own person—one does it by not being who their parents are or trying not to disappoint their parents. These three are amazingly supportive of each other, despite the intense competitive testing they did to be picked for Team 3. Those are characters I can support. NASA’s tests are no joke. Tests, tests, tests. These are incredibly intense. These characters go through a lot of tests that determine how intelligent and capable they are with dealing with situations that may happen at NASA’s Interworlds Agency. Only the best of the best. First, they are put through tests to eliminate hundreds of teens vying for a position on Team 3—tests like simply solving a math problem, if you’re willing to sabotage others for your own gain, or whether you’re capable of doing something that might put people’s in harm’s way. When they get on Team 3, these characters go through simulations that test their patience, their attention span, and their psyche. I don’t think I would be mentally prepared for these tests, but these characters—they constantly think outside the box. The aliens are not what you think they are. There is no doubt that there are lifeforms beyond Earth in What Goes Up, and when they appear, they are not the aliens you think they are. They aren’t here to make pleasantries; they’re here to destroy Earth, but for what purpose? I think the big shock of these aliens are who they are. I had to keep reading because I didn’t quite believe what had unfolded (that’s a good thing!). Should you read What Goes Up? Yeah, if you’re looking for a weird space book about kids actually supporting each other (despite the intense testing competition), What Goes Up is that book for you. 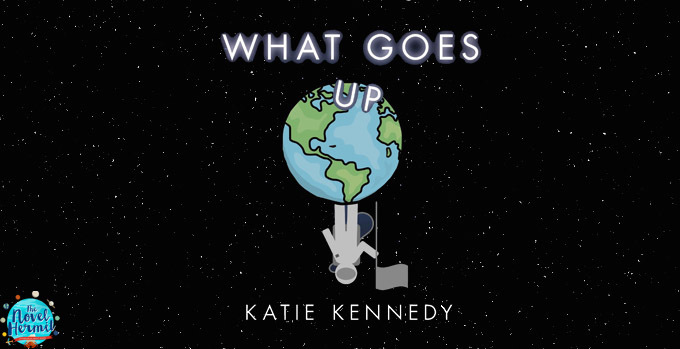 I didn’t like Katie Kennedy’s debut book as much as I liked What Goes Up because this book gets into your head. You’ll want to learn about these characters and their background, and how they approach the tests and simulations. It’s a lot of fun. You’re in for a weird intergalactic ride. I generally don’t like stories about space (with the exception of guardians of the galaxy), but I really like the cover and NASA is cool so maybe I should give it a shot? I liked her debut better than this book. I found the m/c of Learning to Swear endearing and the plot super intense (impending doom and all that). This one I LOVED the beginning competitions, but once the aliens came, I think I got lost in trying to wrap my head around the science. Glad you liked it!! Great review!